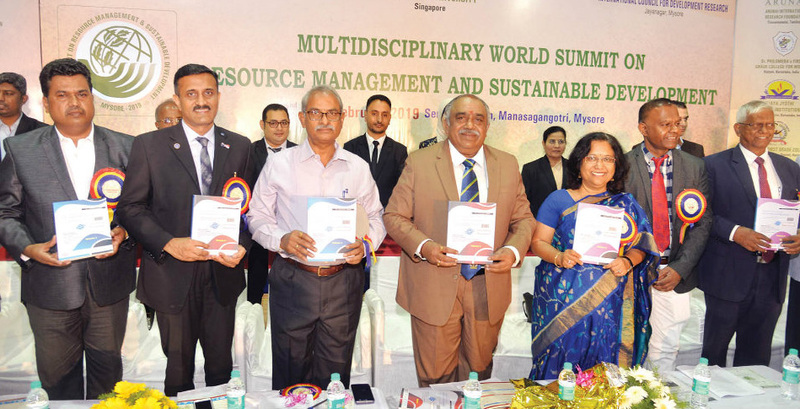 James Cook University co-organised a three-day World Summit on Resource Management and Sustainable Development together with University of Mysore, India, Maharani’s Arts College for Women, Mysore and International Council for Development and Research, Mysore from 22-24 February 2019 at University of Mysore. “This summit is the premier interdisciplinary forum for social scientists, life scientists, engineers, and practitioners to present their latest research results, ideas, developments, and applications in all areas of Sustainable Development on the areas of Environmental, Health, Energy, Economic, and Socio-Cultural Issues”, said Dr. Desti Kannaiah, Senior Lecturer Business at the Singapore campus of James Cook University who is also one of the Directors of the World Summit. Associate Professor Abhishek Bhati, Campus Dean of the Singapore campus of James Cook University who gave a keynote address at this event said, “Predicting and maintaining or altering the distribution and abundance of various organisms are the primary goals of natural resource management hence, the effective management of natural ecosystems depend on ecological knowledge”. Paradoxically, management of ecosystems often ignores relevant ecological theory and many ecological investigations are pursued without appropriate consideration of management implications. University of Mysore, Vice-Chancellor Prof. G. Hemanthakumar inaugurated the conference and released the conference proceedings in three volumes. This conference attracted for about 1,500 participants which includes Minister for Higher Education Government of Karnataka, India, Members of University Grants Commission, India, Vice-Chancellors of various Universities, leading academic scientists, policy makers, executives of private and public sector, researchers and scholars, in the domain of interest from around the world. Dr. Thirumaran, Head of James Cook University Business Department shared that by participating at this summit JCU is sharing the strength and its focus on sustainability. For further information on our offering in Business program, click here.